I think Curious Kiwi should read the hunger games number 2 (Catching fire) because it sound like a cool survival story. I think it is also for people that like action books. For this activity I had to choose what book Curious Kiwi (Summer Learning Journey's mascot) should read on the plane. The three book choices were: Matilda, The Hunger Games Catching Fire and Diary Of A Wimpy Kid The Ugly Truth. For this activity I have to think of all of the books I have read from the past year. 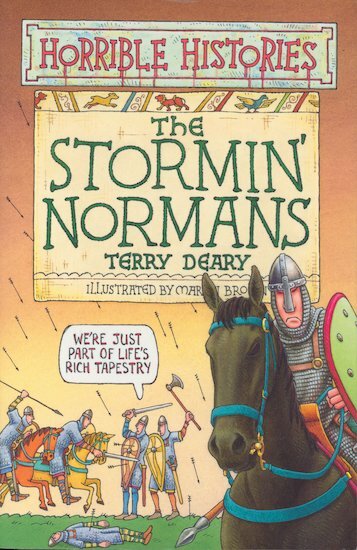 One of the books I read last year was called Horrible Histories The Stormin' Normans. I liked it because I gave me lots of facts about history. I learnt that William the Conqueror defeated King Harold at Hastings in England. The author of this book is Terry Deary. For this activity I have to make a wordle using the words of the things I would defiantly take to the United Kingdom. For this activity I have to pick 10 things that I would defiantly take to the United Kingdom. I picked ten items out of a total of 16 items from a list. I also have to explain why I chose these items. For this activity I have to make a list of everything I will need to bring with me. 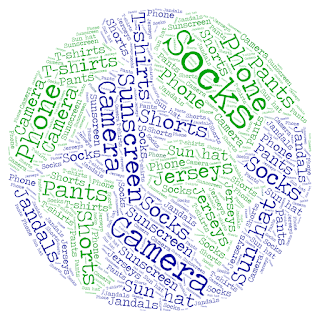 A star (*) means that item is one of the five most important things. Today, for this activity I have to imagine I have $1 000 000 and I have decided to start my own airline right here in New Zealand. This is my logo for my airline called: NZ Flight. I hope no airline already has that name though. For this activity I have to list three things that you will need to do when to stay safe on a plane. Number 3: When your plane is in danger, reach down to the bottom of your seat and get the life jacket there. For this activity I have to post three facts about the country I chose (United Kingdom). Number 3: The British Library in London is the biggest library in the world. For this activity I have to chose one country out of six, that I would like to visit. The country that I chose was United Kingdom. I chose United Kingdom because my Grandmother and my Grandad (On my dad's side) were born there. Also I want to see some of England's landmarks or interesting places like the London eye which is a giant Ferris wheel. For this activity I have to explain what my favorite subject at school is. My favorite subject at school is reading. I really like to read and I read everyday. I like reading because it is cool and interesting. My favorite books are books with lots of action and adventure or a book from a movie that I like. Question 5: If you could travel anywhere in the world, where would you go? Why? I would go to Hollywood in America, because that is where lots of famous movies are made! For this activity I have to write about my family. I have to include information like my family's names, how many siblings I have and more! I have 5 members in my family including me. There is my mum, dad, two brothers (one older than me and one younger than me) and me. My mum's name is Emmy, my dad's is Nick and my two brother's names are Thomas and Alex. My mum is Samoan and my Dad is kiwi. For this activity I have to find a friend or family and ask them what their five favorite things to do in the summertime are. The person that I asked is one of my friends called AJ. For this activity I had to write a New Zealand recipe. The recipe I am doing is a steak and cheese pie. Heat the oil and butter in a large frying pan then add the onion and garlic and cook until the onion is golden, add the beef mince and cook until well browned, stirring break up any large lumps. Stir in the flour and cook for approximately 30 seconds, gradually add the beef stock and beer and bring to the boil. Add the tomato puree and vegemite, balsamic vinegar, mixed herbs, salt and pepper to taste. Lower the heat and simmer gently 10 minutes, then remove from the heat and allow to cool. Assembly and Baking: Cut off a quarter of the pastry block and set it aside for the pie lids. On a lightly floured work surface, roll out the larger piece of pastry to a square approximately 4mm thick, cut into quarters. Line each individual pie tin, ensuring the pastry is firmly lined against the sides, leaving the pastry hanging over the edge of the tins. Roll out the smaller piece of pastry to a square approximately 3mm thick, cut the square into quarters, cover with plastic wrap and set aside. Fill each pastry lined dish with the mince filling, almost up to the top then add a small handful of grated tasty cheese. Brush the edge of the pastry bases with water and place the pastry lid on top. Seal edges and trim excess pastry off with a sharp knife. Whisk the egg and water together and brush over the pastry top, sprinkle with sesame seeds. Rest for 1 - 2 hours (or longer) before baking. Place directly into a preheated oven set at 220°C and bake for 25 - 30 minutes or until golden brown in colour. Allow to cool in the tins for 10 minutes, then remove from the tins and place on a cooling rack. Serve with your favourite tomato sauce and a crisp green salad or bowl of French fries. For this activity I have to compare the breakfast normally eaten in another country to the breakfast I eat in New Zealand. The country I am going to compare my breakfast with theirs is Germany. The foods that people eat in Germany are things like cheese platters, beans with toast and eggs, and mezze platters which is meat. Their food is quite different from mine because I eat cereal (Weet-bix) or toast and a cup of milo. I think that the bean with toast and eggs will be quite yum from breakfast, but the other two to me are what I might eat for dinner. For this activity I have to list five major landmarks in New Zealand. A star next to a landmark means I have personally seen it. For this activity I have to say which of the five landmarks from either United Kingdom, Chile, Canada, Germany and Malaysia I would go to. I chose to go to Buckingham palace, Stonehenge, and the London eye which are all in the United kingdom. I chose to go to these places because I really want to see them and I would like to go on the London eye because it is a massive Ferris wheel, which equals awesomeness! Today for this activity I have to create a new public holiday. My public holiday is going to be called Election day. It happens when the adults vote for someone to be Prime Minister (Just in New Zealand). Everyone including the kids has a day off school and work. You don't have to eat any special foods though. For this activity I had to explain why I wouldn't want to be prime minister. I wouldn't want to be prime minister one day because if you are prime minister you have to make lots of important decisions. People also might hate the prime minister for the decisions that he/she makes. If you become prime minister you might get very stressful. For this activity I had to find out two facts about Barack Obama. (Extra) Fact Three: Barack Obama was born on the 4th of August 1961. For this activity I had to pretend I was a prime minister and I had to make up my own three laws (rules). Today the activity that I did was to write a short paragraph describing my sporting hero. My sporting hero is Lionel Messi. He plays soccer for Argentina's team. He is my favorite sportsman because when I see him play a game of soccer he doesn't get angry if the opposition score a goal or win.